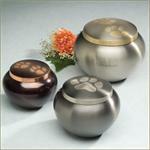 Brass urn with an electroplated finish of slate, pewter and/or copper. Tiny pawprints adorn the tops in either pewter, bronze or copper finish. You may choose from either 1 or 2 lines of engraving, each at an addtional charge. Engraving of your choice may be ordered here. Also available in small and medium size.